We take a look at Jupiter’s fourth installment of the Picross puzzler series, Picross e4. Read our full review to see what we thought! There are an ever-increasing amount of games these days that indulge in streamlined Sudoku-esque puzzle solving. In fact, there’s a large amount in this franchise alone. While the public’s fascination with these games is clearly far from over, are these games still accomplishing what they used to? Or is their welcome mat slowly being pulled out from under them? 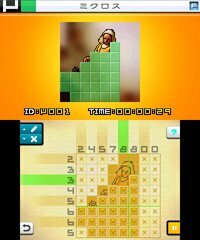 Fortunately, in the case of Picross e4, the puzzler is at least trying very hard to remain engaging and relevant. I know what it is! It’s an orange! The goal of Picross, if you’re unfamiliar with the series and didn’t wrack your brain through e-e3, is to create an image by filling in the proper squares on a grid. Numbers along the sides of these grids help you determine how many squares in each row and column should be shaded in accordingly. By mashing all of this together (along with a degree of luck, if you prefer to play more cavalierly), you’ll end up with a brand-spanking new completed image (such exciting things as an apple, worm, or chopsticks). There are two styles of gameplay here, “Normal Rules” which gives you sixty minutes to finish a puzzle to fully colored completion, and every shading mistake you make adds time to your total. Or, there’s also “Free Rules” which let’s you play at your own pace, with no penalties, often allowing things to get fairly messy. You also have the luxury of switching between these two styles whenever you see fit too, in case you just can’t make up your mind because too much of your brainpower is going to cracking these puzzles. Picross e4 offers you your main Picross gaming (with over 100 grids varying from 5×5 setups, to the newly massive 20×15 designs), but also, Picross e2’s Micross mode has returned. Here, you start by completing a puzzle, but then each square of this puzzle becomes its own 10×10 puzzle. Naturally, completing these shows you a little more of the overall picture you’re trying to uncover. These can take quite some time to figure out and realize the full scope of them, and thankfully, there’s no time limit present here. Also making a comeback is Picross e3’s Mega Picross mode. In this style, there are now number clues that cover two lines, causing you to balance the regular sized clues, as well as staying on top of these new larger ones. This all amounts to over 150 Picross puzzles, 45 Mega Picross puzzles, and two massive Micross behemoths. 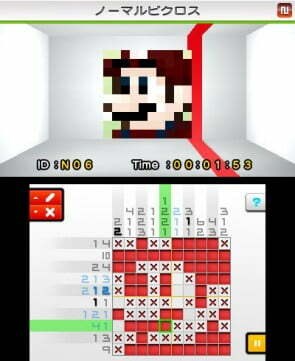 A video game crossover of monumental proportions…MARIO and PICROSS, together at last! 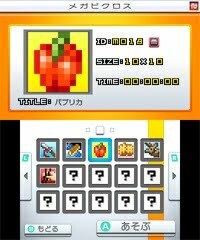 Picross e4’s bright color presentation and vibrant art design help this entry stand out amongst the rest. There are a few puzzles that feel like guilty indulgences (which the game could stand to have more of) featuring Nintendo characters and other video game-related pictures, and here in particular, the colors pop. The music is undistracting enough, which isn’t exactly a compliment, but it’s not the worst thing either. Basically, there’s a rather limited selection here, and nothing that’s insanely catchy. Increasing the track list even a little would have helped break up the monotony of the gameplay, especially with the game knowing you’ll be going through so many puzzles. The music isn’t impeding your gameplay or wrecking your concentration though, which is paramount, and could have been the case if mismanaged badly enough. There are tutorials for all three modes of gameplay, which are helpful enough if you’re an uninitiated Picross player. That being said, these get kind of verbose at times, and it’d have made a lot more sense to show you (or even have you play through) examples, rather than telling you how this all works. Both button and touch controls are offered, with the touch system being responsive and the quicker, more natural way to play. The entire game flourishes in its minimalism, but there’s still little added pieces of flair, like the numbers fading out when you complete their requirements. With Mega Picross and Picross puzzles also at your disposal, you may suffer from a Picross overdose (not liable)! Another fun extra being flung at you here is that If you have game saves from the previous Picross titles, it’ll also unlock some extra puzzles from past games, which is a nice, unexpected feature thrown in that totally didn’t need to be. So while there are some nice unlockables present here, they are just more Picross puzzles like the hundreds of other ones that you’ve been doing. Picross e4 gives a lot to its audience, but a slick package is hardly enough here, and it very much does feel like the fourth entry in a series. If it was just having more fun with itself, and seeming necessary, all of this would go down better. There is something to be said for a game that firmly knows what it is though, and the inclusions from previous titles here easily make this the best entry in the series since the original. All of this amounts to this being a totally pleasant, non-essential puzzle game that will easily help you fill up a few hours, but you likely won’t be thinking about it once it’s out of your 3DS. Especially when the inevitable Picross e5 comes out. Keep those game saves at the ready. Picross e4 is an enjoyable title due to its impressive, addicting puzzling gameplay that offers up a sheer wealth to work through, all with an attractive presentation, and easy-to-pickup rules. That being said, this sort of game is beginning to feel stale, and while Picross e4 does it well, that doesn’t mean as much as it used to. When this is combined with other shortcomings, such as the game's limited music and eventually-montonous gameplay, the veneer on Picross e4 begins to fade.